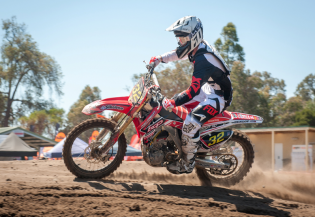 For some classes today, Thursday meant just one finals race, meaning when racing kicks off for the final time at the 2015 KTM Australian Junior Motocross Championship tomorrow, it is game on. When racing got underway for the talented 65cc Solo 11 years class, it was the usual suspect Benny Novak who took the holeshot ahead of Cody Chittick and Jett Lawrence who exited turn one in second and third. 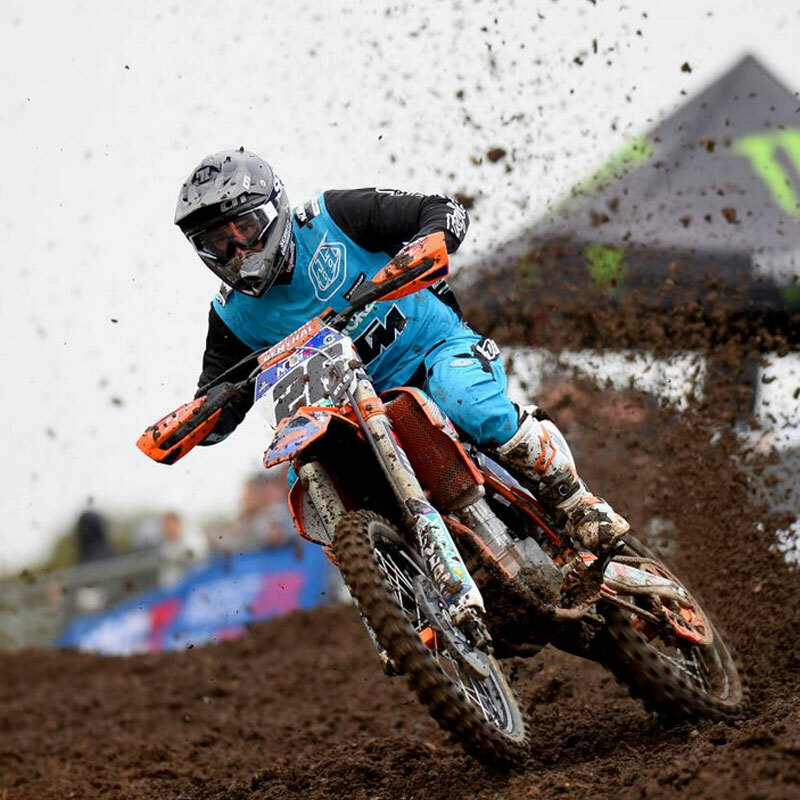 However sticking to trend, KTM Junior Motocross Racing Team’s Lawrence moved in to the race lead after only one lap, leaving the battles for remaining podium positions to take place behind him. And battle they did. Tyran Tomich charging into third position, while Chittick maintained second position well behind Lawrence. At the conclusion of the seven-minute moto it was a familiar sight as Lawrence crossed the line with the win by 26 seconds ahead of Chittick in second, while Tomich secured a hard fought third. When racing got underway, the undefeated Lawrence looked likely to keep his title, moving in to the early race lead ahead of Tom West, Justin Hart and Wyatt Chase who commenced their three way battle for second. As racing progressed, Lawrence continued to stretch out his lead, putting a 12 second deficit on closest threat Hart, while Chase continued to follow Hart and maintain third position. 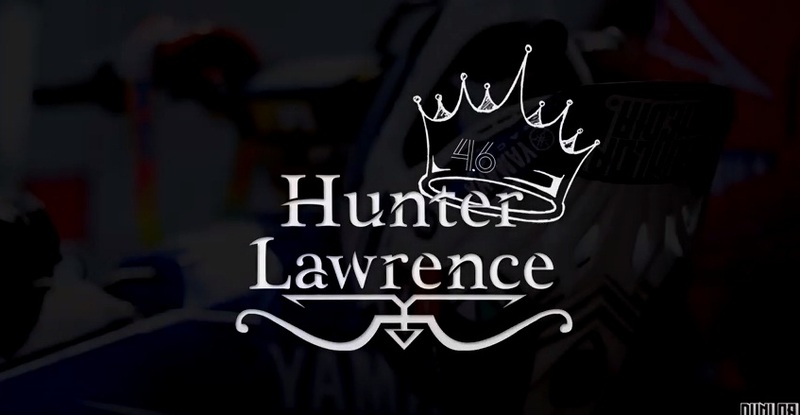 With Lawrence not backing off, and bettering his own lap times, it was no surprise to see his number 46 machine collect the chequers ahead of Hart and Chase who finished in second and third, unable to break Lawrence’s AJMX winning streak. When the big boys came out to play for their final, the number 34 machine of Callum Norton got the start he wanted, taking the early race lead ahead of Taj Marshall and Caleb Grothues. However there was no fairytale start for Mat Fabry – after getting caught up in turn one, Fabry was forced to start from dead last, putting one of the major contenders at the back of the pack. However with confidence from yesterday up his sleeve, BCP Honda’s Marshall wasted no time in making the move on Norton, handing spectators a new race leader before the halfway point. With only one lap to go, the running order saw Marshall out front by two seconds, followed by Norton, Grothues, and Jake Williams. When the tenth race for the day concluded it was once again the hard charging Marshall who secured the race win, ahead of Husqvarna mounted Norton in second, while Grothues rounded out the top three in third. When the 65cc machines headed out on to the rough and rutty track, Noah Smerdon slotted himself into the early race lead, while Deegan Mancinelli and Liam Atkinson followed closely behind. As racing progressed, Atkinson made his way up to second place behind Smerdon, while Connor Rossandich found himself in an outstanding third. 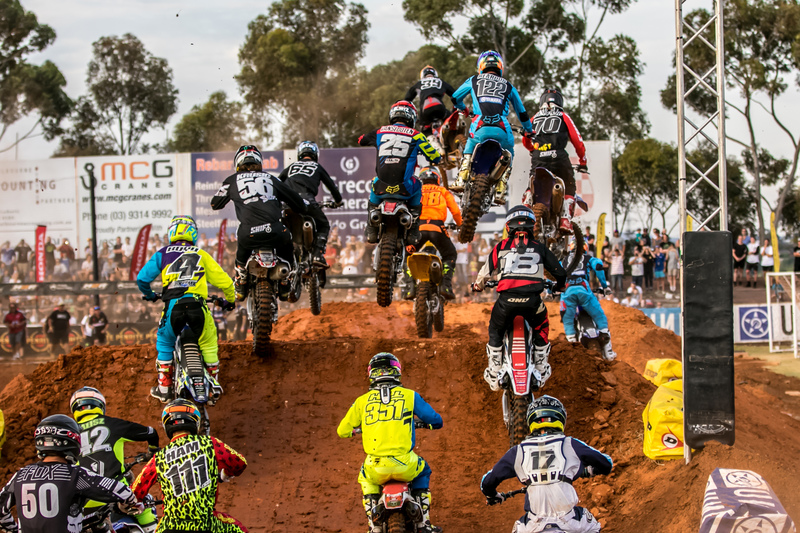 And with the 65cc class on an absolute charge, a three-way battle for the lead emerged – with Atkinson pressuring Smerdon for the lead, while Atkinson felt the pressure of Myles Gilmore. As the last lapboard came out a single second separated first to third, keeping fans on the edge of their seats. 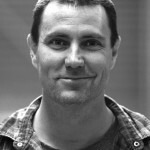 When the chequered flag came out Smerdon took the race win ahead of Gilmore in second, while Zachary Watson inherited third when Atkinson went down on the final lap. As the ladies lined up once again for racing, it was KTM mounted Tahlia O’Hare’s turn to shine, as she got to a cracking start ahead of Hayley Miller and Kara Cats. With O’Hare out the front with a huge lead, the battle for positions was left to happen behind her, and following this year’s AJMX tradition, Danielle Foot made her way in to second position, ahead of Cats, while Miller came to grief dropping back to fifth. When the chequered flag flew, Western Australia’s O’Hare did exactly what was required to take the race win by 47 seconds ahead of Foot, followed by Cats who crossed the finish line in and impressive third. When gates dropped, onlookers were treated as Hunter Lawrence ripped a huge holeshot, while a number of riders were caught up in a first turn crash, adding to the racing excitement. With one lap down, Lawrence extended his lead to six seconds on Tasmanian Wade Kirkland, while Cooper Pozniak slotted comfortably in to third. With Lawrence and Kirkland looking comfortable in first and second, the focus shifted to the battle for third, with Justin Hart and Pozniak going head to head, keeping spectators eyes glued to the track. However Lawrence proved he was unstoppable once again, the Queenslander taking the race win by a whopping 37 seconds ahead of Kirkland and Pozniak who finished in second and third respectively.